The Raspberry Pi official forums are the central online meeting place for the Raspberry Pi community. They’re where you’ll find support from hundreds of thousands (141,183, as of this morning) of other Pi users, including people from our own engineering team; lots of inspiration for your own projects, and loads of advice. You can chat to a selection of those of us who work at Raspberry Pi there too – we’re usually poking around in there for part of the day. 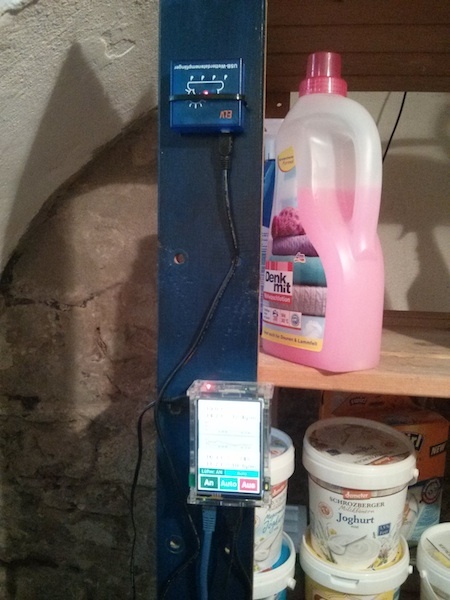 We found this rather brilliant hack to ventilate and maintain a cellar’s humidity on the forums. 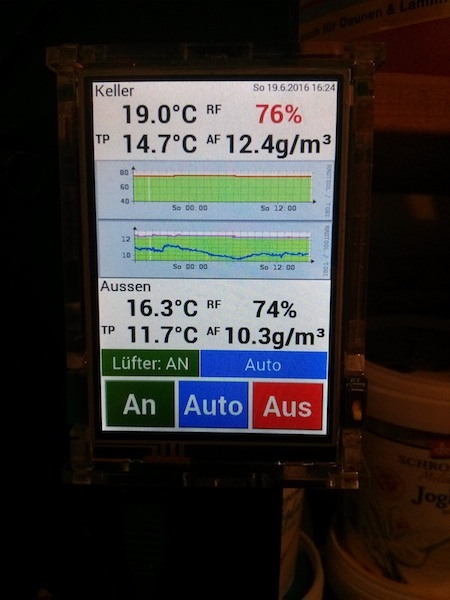 Forum member DasManul, from Frankfurt, put this together to measure temperature and relative humidity inside and outside his cellar, and to use those values to calculate absolute humidity. The setup then ventilates the space if the humidity inside is higher than it is outside. On reading what he was up to, I assumed DasManul was looking after a cellarful of wine. Then I saw his pictures. He’s actually tending bottles of fabric softener and yoghurt. 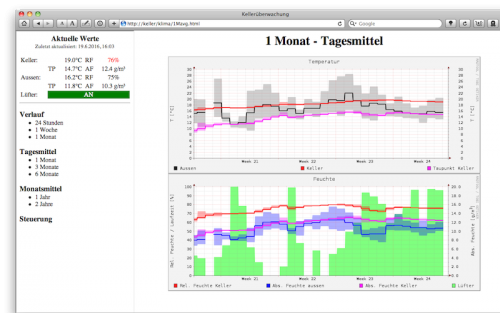 The system also outputs more detailed graphs (daily, weekly, or monthly) to a website served by ngnix, which allows you to control the system remotely if you don’t happen to be down in the cellar conditioning your fabric. DasManul says that he’s not much for hardware tinkering, and didn’t want to start drilling into his house’s infrastructure, so he used off-the-shelf parts for sensing and controlling. 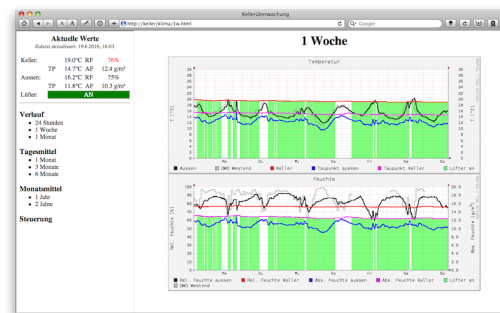 Two inexpensive wireless sensors, one indoors and one outdoors, from elv.de, do all the work checking the humidity; they feed information to the USB receiver, and intake and exhaust fans are controlled with an Energenie plug strip. (These things are great – I use an Energenie plug strip to turn lamps on and off via a remote PIR sensor in my living room). DasManul has made all the code available (with German and English documentation) over at BitBucket so you can replicate the project. 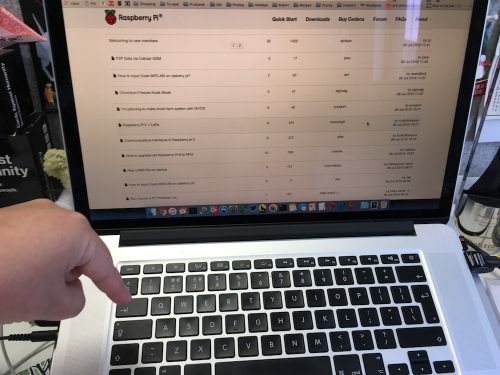 There’s plenty more like this over at the Raspberry Pi Forums – get stuck in! If I build the setup, can we have a wine cellar at Pi Towers? I really feel that’s the missing piece to an otherwise perfect workplace. Also, this is actually a really good creation, well done Frankfurt! I think that if we’re staying within the spirit of the project, it’s going to have to be a fabric softener/yoghurt cellar. Which may dampen your enthusiasm a little. We have hardened carapaces. Sometimes a little conditioning can go a long way. Great project! Which fans / ventilators did you use?